On November 1st, thousands of people lined main street to celebrate Nevada’s 150th birthday at the Nevada Day Parade. It was a cold, damp morning, but this didn’t stop the crowds from coming out and staking their claims along the parade route. In addition to appearing in the parade with the Carson City Sheriff’s Office, our Search and Rescue team assisted before and during the remainder of the parade as well. 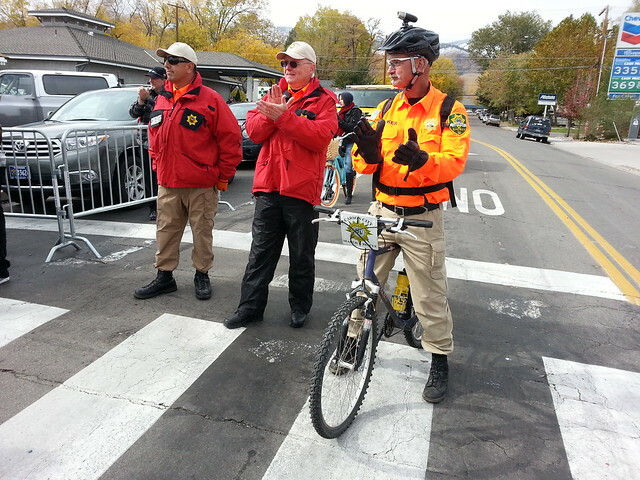 SAR personnel kept critical intersections clear to allow for emergency vehicles if needed, and our Mountain Bike Team assisted by patrolling the parade route. The bicycles proved to be very handy for getting through the crowd efficiently without causing a disruption in the event. The weather improved steadily throughout the morning, and no major incidents were reported during the parade. Another safe and fun Nevada Day was had by all!